Large, white, day-neutral variety has a mild, sweet flavor that is great for salads, salsas, sandwiches and cooking. 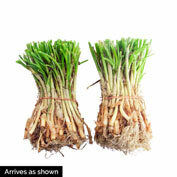 Adaptable to much of the United States, Superstar Hybrid Onion stores up to two months. This exceptional onion was the first day-neutral variety to win an All-American Selections award. Onions are affected by the amount of light they receive. Day-neutral onions begin forming bulbs when daylight lasts 12-14 hours. They usually are sweeter and less pungent than long-day varieties. 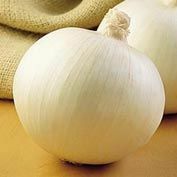 Day-neutral onions usually store better than short-day onions. 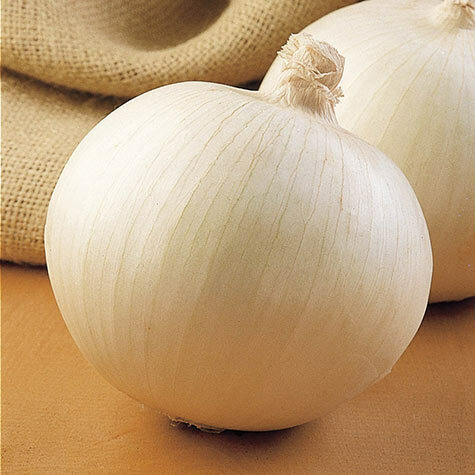 Day-neutral onions can grow in many areas of the United States, except the far North and deep South. One bunch will have 55-75 plants. Depth: Seeds: 1/2 inch. Start seed indoors, in late Winter, 8 - 10 weeks before setting outdoors. Set outdoors as soon as the soil can be worked. Plants 1 inch deep. Fruit: Large white variety with mild sweet flavor. Comments: This star will shine in any garden. Large white variety is the first day neutral to win an All American Selections award! The mild sweet flavor is great for salads, salsa, sandwiches and cooking. Superstar Hybrid can store up to 2 months and grows well anywhere!